BINUS UNIVERSITY and UDAYANA UNIVERSITY invite international students from any fields of study or disciplines to a Joint International Short Program “SME Business in Indonesia – From Bali to the World!” in Jakarta and Bali. The Joint International Short Program is open to minimum 6 participants. The program is conducted in English. If you are interested in SME business export and want to explore Bali of Indonesia this course is for you. The two-week program with one week in Jakarta and one week in Bali is organized by BINUS UNIVERSITY and Udayana University and comprises of business classes, visits to Bali SMEs, and cultural exploration of Jakarta and Bali sights, sounds and tastes. 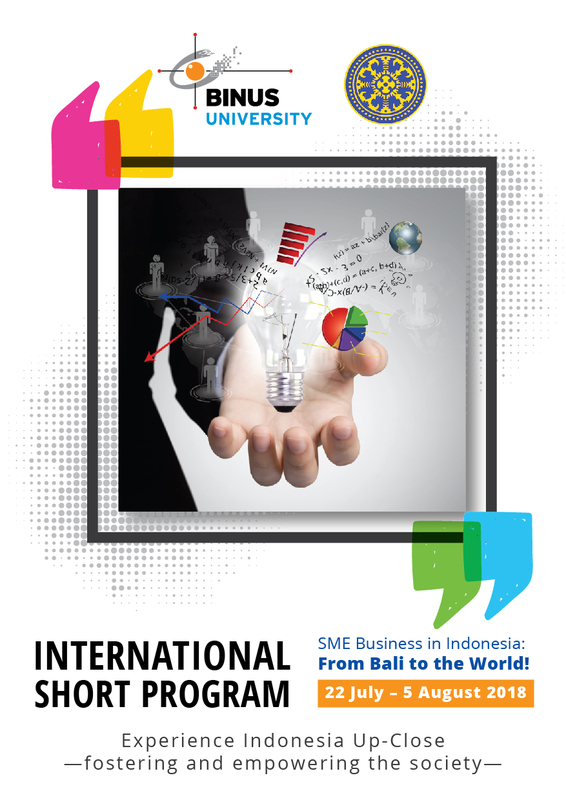 The course aims to develop an export business plan for SMEs in Bali with 4 course credits earned. Upon completion, students are expected to understand business culture and opportunities in Indonesia. Specifically, students will work with Bali Tangi (spa products), Bumi Ayu Hotel and Wisnu Karya Putra International (timber products). Applicants who wish to participate in the Short Program must apply by June 30, 2018. The selected participants will be notified within one week after the registration deadline. Payment should be made by June 30, 2018. If minimum number of participants is not achieved, program is canceled and fee will be refunded. Payment details will follow.